The annual audit conducted by a top New Mexico accounting firm has returned no findings for the New Mexico Secretary of State’s Office, according to a report released yesterday by the firm Atkinson & Co., Ltd. According to the Secretary of State's office, the firm gave the office a clean audit and no findings of significant deficiencies. The firm returned an “unqualified” opinion, meaning that in the auditor’s professional opinion, the financial statements passed muster without any “qualifications,” according to the report. An audit also looks at internal controls. In examining internal controls over financial reporting, auditors will seek to ensure the agency has established effective procedures to reduce the chances of errors or fraud. The current Secretary of State audit found “no findings” of control deficiencies. The Secretary of State’s Office has sought to reduce the number of audit findings inherited from the prior administration. In 2007, 20 findings pertaining to the former administration were identified. Over the last four years, the Secretary of State’s Office reduced the number each year until the audit just completed for Fiscal Year 2010 found none. The audit, released yesterday, shows no current year findings, no material weaknesses identified, no significant deficiencies identified, and no noncompliance noted, according to the report. 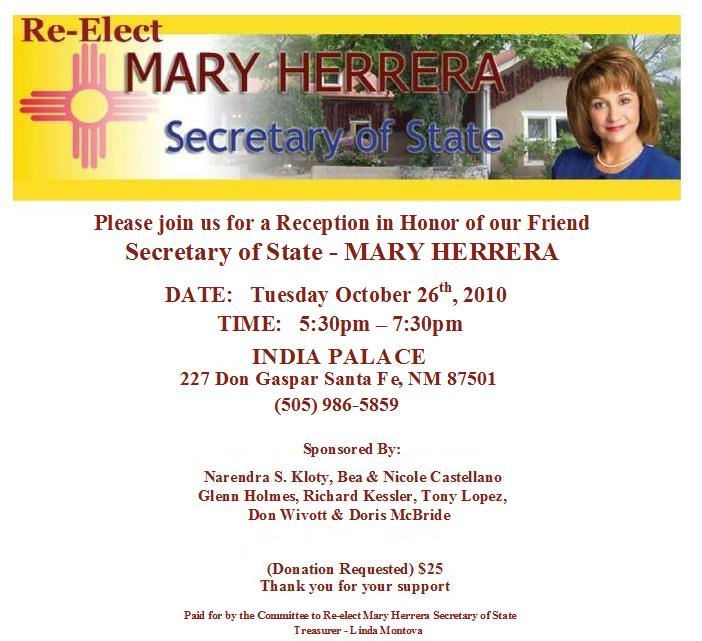 Please join us for a reception in honor of our friend, Secretary of State Mary Herrera, on Tuesday, October 26, from 5:30 PM to 7:30 PM at India Palace, located at 227 Don Gaspar in Santa Fe. This event is sponsored by Narendra S. Kloty, Bea and Nicole Castellano, Glenn Holmes, Richard Kessler, Tony Lopez, Don Wiviott and Doris McBride. See flyer for more information. Click to see a list of organizations that have endorsed the reelection of Democrat Mary Herrera. Check out Secretary of State Mary Herrera's new TV ad, which will start airing tomorrow statewide, according to her campaign. The ad highlights the improvements Herrera, a Democrat, has implemented in her first four-year term -- including a paper ballot system -- while saving taxpayers millions of dollars. When Herrera took over, she says the office was mired in problems, which the ad points out arose under the direction of her predecessor. As the ad says, Mary Herrera cleaned the mess up. The 30-second spot also describes Herrera's Republican opponent as a long-time legislator in Santa Fe "who hasn't run an election in nearly 20 years. She votes with big corporate lobbyists who fund her campaigns and opposed accurate paper ballots." To learn more about Mary Herrera's record -- as well as her detailed response to accusations and rumors being spread by supporters of her opponents -- check out this statement released recently by her campaign. Also be sure to visit her campaign website and Facebook page learn how you can help with her re-election efforts. Secretary of State Mary Herrera swung back at critics at a fundraising event held in Las Cruces on Sunday afternoon, expressing pride at having professionalized her office and having effectively erased an inherited $3 million dollar debt. “That never seems to be reported in the press,” Herrera said. “When I took office the accounting systems were in chaos,” she continued. Herrera also pointed out that she had inherited a Secretary of State’s office whose electronic systems were inadequate, out of date and technologically insecure. “We are now a national model for running elections,” she said. Citing the economic efficiencies she has brought to the Secretary of State’s office, Herrera pointed to her decision to revert to printing ballots by demand, a system by which only ballots needed on election day are generated at local polling stations. Ballot-by-demand has slashed $303,000 from the state budget. Also cut was an additional $250,000 in postage, a savings Herrera negotiated by obtaining a lower postal rate for absentee ballots and other communications sent through the post office. Herrera also pointed to an electronic record system that is being piloted in Taos, Valencia and Lea counties that she envisions being implemented statewide to further trim the budget in her office. Herrera said she was proud to have implemented a model state campaign donor reporting system at a fraction of the cost that other states have spent. She established New Mexico’s reporting system by purchasing a software system developed by Washington state for $50,000 and scaling the software to New Mexico’s needs. She also brought the electronic delivery system in-house to further reduce costs. Previously New Mexico had outsourced its reporting system. Herrera noted that Wyoming is currently spending over $2.5 million to produce the same results, while New Mexico's system costs only $176,000 annually. She also took pride in the effectiveness of the vote reporting and accuracy of her office. “Protecting the vote is the most important thing we do,” Herrera said. Herrera has been brought to Washington testify to Congressional committees on her effective implementation of election reform measures mandated by Congress. On Sunday, State Senator Mary Jane Garcia strongly urged local Democrats to support Herrera and to remember the importance of less visible races like that of Secretary of State. “We need to make sure Florida never happens again,” Garcia said. Asked what she intended for a second term, Mary Herrera promised to seek authority to permit absentee ballots from military personnel to be canvassed over an additional period. Ballots from military personnel serving overseas frequently fail to arrive in time to meet the statutory deadlines for being counted. “It doesn’t cost a thing to wait a few extra days,” Herrera said. She also outlined her plans to establish vote centers throughout New Mexico. This is a guest blog by Victor Raigoza, who serves as Vice Chair of the Democratic Party of Bernalillo County. It's in the form of an open letter to fellow Democrats. The election is in one month and now is the time for us to come together and support those candidates who currently hold or are seeking office as Democrats. Today, I want to focus on the race for Secretary of State. For the last eighty years our party has held this office, and I intend to do everything I can to assure that this important office stays in Democratic hands for the upcoming re-districting year. Our current secretary, Mary Herrera, has served and overseen the biggest election in New Mexico state history. She not only oversaw the election -- but unknown to most -- her efficient manner of running the 2008 election made New Mexico a model state for Presidential elections. You probably didn't know this because the press hardly ever reports the good things about our candidates, and Mary has never been one to "toot her own horn." She has always just done what is expected of her and the job that the people elected her to do. Mary did such a good job in the 2008 elections that she was invited to testify before Congress on how to run an efficient election. Let me tell you some more about my friend and our party candidate for Secretary of State, Mary Herrera. We constantly hear the other side go on and on about how much money Democrats spend. If that is their litmus test for holding office, they should be voting for Mary in record numbers. In her first term, Mary has saved us, the taxpayers of New Mexico, millions of dollars. She was able to turn around an office that was in the red and make it into one of the most efficiently run offices in all of state government. While saving us money, she obtained and implemented a state-of-the-art election reporting system. Most systems like the one she obtained would cost millions -- yet Mary negotiated a price for the system of less than two hundred thousand dollars. By allowing the ballot on demand, Mary has saved thousands in printing costs and production of ballots that used to go unused. Under her management, as voters turned out in record numbers, her cost per voter went down during the elections. I bet you have never heard any of this. Some of the important changes in her administration have been the full implementation of the Americans with Disabilities Act, which means that now all New Mexicans, regardless of their disability, can now vote. Mary has always fought to assure that no voter would ever be denied their American-given right of voting. She has also implemented a system that now allows victims of domestic violence to register to vote without fear of being found by their abusers -- once again, allowing for registered voters to vote and participate in this great American right. Under Mary, our men and women fighting in the war zones now get full ballots, as opposed to those that only used to have the federal races. Those who fight for our right to vote should be able to vote a full ballot while serving. I could go on and on about Mary's accomplishments, but I won't. She has proven she can run an economic and effective office, while running efficient elections. She has proven she can save the taxpayers money, while providing us with state-of-the-art equipment. And she has proven that she will never deny a single New Mexican the right to vote regardless of their disability, needed privacy or distance while off defending our nation. Please join me in assuring that we keep Mary Herrera as our Secretary of State by sharing these points that, unfortunately, are not yet well known among New Mexico voters. This is a guest blog by Victor Raigoza. If you'd like to submit a piece for consideration as a guest blog, contact me by clicking on the Email Me link at the upper left-hand corner of the page. Today, New Mexico Secretary of State Mary Herrera's office released a letter to her from the office of Attorney General Gary King and written by Assistant Attorney General Tania Maestas that upholds the legality of the Secretary's decision to allow gubernatorial write-in candidate, Kenneth A. Gomez, on the November general election ballot. Gomez is a self-described tea party supporter from Bloomfield. Based on our examination of the relevant New Mexico constitutional, statutory and case law authorities, and on the information available to us at this time, we conclude that the ballots, as presented, are neither blatantly illegal nor unconstitutional. We further conclude that the New Mexico Constitution does not specifically prohibit the write-in gubernatorial candidate and that the Secretary of State has not done anything illegal. Herrera's Republican opponent in the Secretary of State's election, Dianna Duran, and some of her supporters have been critical of Herrera's decision to allow Gomez to be a write-in candidate for governor because he hadn't indicated anyone to serve as his lieutenant governor to form a ticket. In New Mexico, candidates for lieutenant governor and governor run separate primary races and the winners of each of those form a ticket that is voted upon as a whole in the general election. Article Y, Section 1 of the New Mexico Constitution states that "the governor and lieutenant governor shall be elected jointly by the casting by each voter of a single vote applicable to both offices." On its face, the current ballot is consistent with the constitutional requirements. The space for write-in candidates in the current ballot requires a single vote. It does not require voters to make two separate votes for governor and lieutenant governor, nor does it otherwise distinguish between the candidacies of the two offices. The ballot does not state the name of write-in candidates; it merely sets forth a blank line for purposes of writing in an individual's name. ... The Constitution does not contemplate or address an individual, like a write-in candidate, who becomes eligible to run for governor by means other than an election. Nevertheless, the Constitution does not, by its terms, prohibit a person from qualifying and running for governor as a write-in candidate without a corresponding write-in candidate for lieutenant governor. The Constitution provides a procedure for filling the vacancy in the office of lieutenant governor, should the necessity arise. The Secretary of State is required to certify a candidate who properly files a declaration of intent pursuant to Section 1-12-19.1(0) of the Election Code. Mr. Gomez timely filed his declaration of intent the day after the primary election, with all the required documentation. The provisions of the Election Code governing the certification of writein candidates do not differentiate between gubernatorial candidates and candidates for any other office in the general election. In particular, the statute is silent as to any additional requirements for the gubernatorial candidate, such as the need for a lieutenant governor candidate or the process for designating a lieutenant governor candidate. Mr. Gomez has met all the statutory requirements for certification. In a written statement accompanying the release of the AG's letter, Secretary of State Herrera reaffirmed the importance of citizens' right to vote for the candidate of their choice, saying, "A ban on write-in Governor Candidates directly disenfranchises an individual's right of association and political expression. I am working diligently to ensure there is no intimidation of voters or interference with the election." Join Secretary of State Mary Herrera at the home of Tobias Rene, the King of New Mexico Music, on Tuesday, August 3, from 6:00 to 8:00 PM. His home is located at 7521 Venice NE in Albuquerque. Click for flyer. It'll be an evening of good food and entertainment, with other New Mexico musicians also attending. It'll be a lot of fun! Contributions starting at $20. Thanks your support! Race Car Driver Bobby Unser Jr.
and as always cash is good! Please RSVP to: Margaret at (505) 261-3942 or by email to maryherrerasos@gmail.com. Contributions may be brought to the event or be made payable and sent to: Committee to Re-Elect Mary Herrera, 812 Vista Faisan Trail NW, Albuquerque, NM 87107. If you are unable to attend you may also contribute online using paypal at www.maryherreraagain.com. 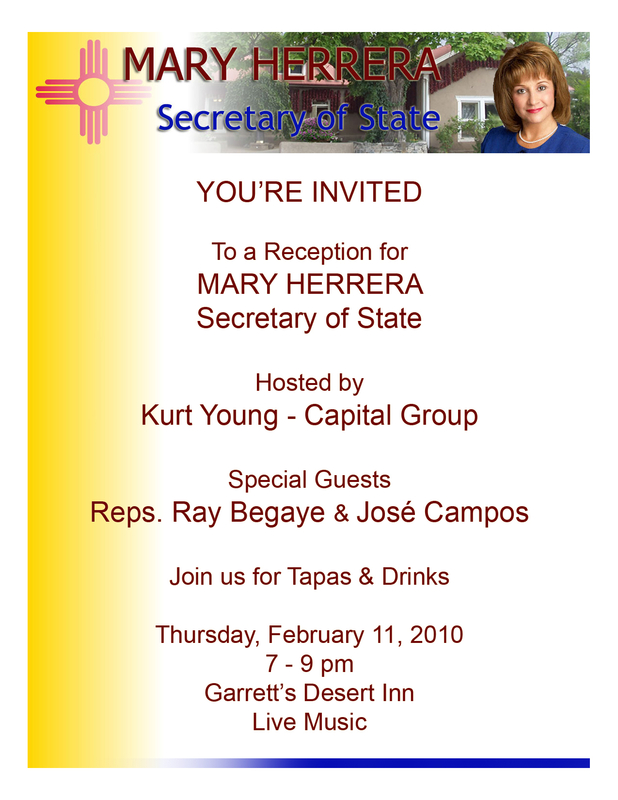 A reception for Mary Herrera for Secretary of State is being hosted today, February 11, at Garrett's Desert Inn in Santa Fe from 7:00 PM to 9:00 PM. There'll be tapas and live music. Click for a flyer with complete information.